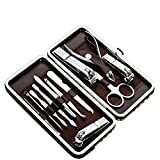 This nail kit including high quality nail clippers, cuticle pusher, cuticle nipper and other usefully accessories. They are manufactured by super careful processes of cutting, polishing, corrosion, laser engraving, plating, screen printing etc. Every product has been checked by strict quality inspection, packed in a beautiful portable case and a protective outer case.